A Tampa man died in a fiery crash that kept I-95 closed for almost 4 hours Wednesday. SEBASTIAN – A man died Wednesday in a fiery crash that shut down I-95 between Sebastian/Fellsmere and Palm Bay for several hours, according to the Florida Highway Patrol. Traffic was backed up for miles, and motorists took a detour on U.S. Highway 1 that caused major delays in Sebastian and Palm Bay. Troopers told Sebastian Daily the man, from Tampa, was the driver of a semi-truck hauling hydrogen peroxide. The I-95 crash was reported around 3:30 p.m. Wednesday near Micco Road in Sebastian. 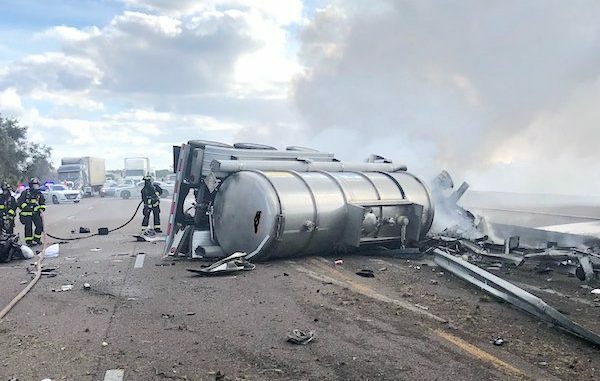 Troopers said the tanker caught fire after the crash and the driver died at the scene. The tire tread separated on the semi-truck and the driver lost control, according to the FHP. Robert Racicot, 79, and Celina Ruel, 61, both of Quebec, Canada, were hospitalized with serious injuries. The driver of the semi-truck has not been identified pending next to kin. North Interstate 95 was shut down at mile marker 156 and south Interstate 95 was shut down at mile marker 173. All lanes reopened at approximately 7:10 p.m.